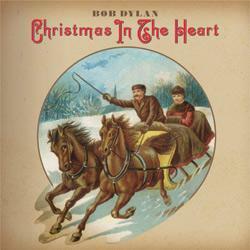 Bob Dylan is releasing a Christmas album entitled Christmas in the Heart (Sean at RightWingBob has some brief but interesting comments on the title). All of the royalties, “in perpetuity,” from this disc will go to providing food for hungry Americans. Long time readers will know, of course, that I think the standard media myth of Dylan as the great American Liberal is hooey; but perhaps even those who embrace that myth will take note that Bob Dylan’s philanthropic work takes place in the private sector, and that it is concerned with Americans qua Americans. His summer tour traveled between small minor league baseball stadiums — out of the way, unfashionable places like Durham, Allentown and Syracuse. If we must attach some kind of label to this troubadour, let us base it on what is obvious rather than what is implied. Bob Dylan is a great American patriot. Consider, for instance, this story. All of the royalties, “in perpetuity,” from this disc will go to providing food for hungry Americans. Just what is it with you folks and Bob Dylan? Yes, enormous was his talent and he could certainly crank out lyrics. However, that he can think at all today, considering his equally enormous drug intake, is as admirable as his song writing.